Electronics - Arcade Consoles - Cambridge Nostalgia & Co. - Retro Furniture, Gas Pumps, Games & More! Ever wondered what it would be like to re-live your childhood in the comfort of your own living room? Wonder no more! 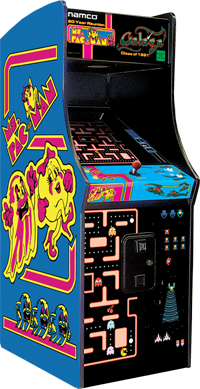 Bring home a Pac-Man or an Arcade Legends 3 gaming console. They are fun for the whole family - and don't require quarters! Real arcade controls, full sized cabinet and 24" commercial arcade monitor. Each side of the cabinet has reproduction artwork from the original iconic arcade games. Dimensions: 24.5"W x 33.25"D x 68"H; 275 lbs. Coin-door has been permanently deactivated, Commercial use is prohibited. Specifications subject to change without notice. The greatest collection of Arcade Games ever amassed! The huge collection of Arcade Legends games plus all 29 award winning Golden Tee Fore! Complete courses, all in one cabinet. Arcade Legends utilizes real arcade controls, including one trackball, two joysticks and fifteen buttons. Arcade Legends 3 is a full sized arcade game for the home, featuring a full sized cabinet, commercial quality arcade controls and a 26" LCD display. Coin-door has been permanently deactivated, Arcade Legends 3 is for home use only. Commercial use is prohibited. Dimensions: 26-1/4"W x 40"D x 67-1/2"H; 345 lbs. Whether you want to bring home the arcade driving experience or hone your racing skills, this fully immersive racing simulator provides a dynamic gaming platform for your favorite PC and PlayStation 3 games. Quick set armrests - raise the armrests instantly locking them into place. High Energy 100 Watt Vibration Transducer rattles the player physically reproducing every nuance of the road. rear storage area which can accommodate a PC or serve as storage for your favorite games and gaming peripherals. Keyboard drawer that allows the player to conveniently access a keyboard and mouse. Blue LEDs will illuminate the undercarriage creating a blue halo effect under the game. Supports PC and PlayStation 3 games (PC and PlayStation not Included). *Please Note* The Redline GT Racer is available by special order only and is subject to availability. Please allow 3-4 weeks for delivery. We are constantly working to update our website with our newest merchandise. If you are looking for something specific, but don't see it here, please feel free to contact us directly by phone at 519.740.6367, email us at info@nostalgiaco.com or stop by the store.